Is the World Bank keeping its promises to Indian tea workers? The future of work has become a popular theme for research in international organisations and institutes. The UN’s International Labour Organization has created a commission on the topic and will devote its 100th anniversary conference in 2019 to it. 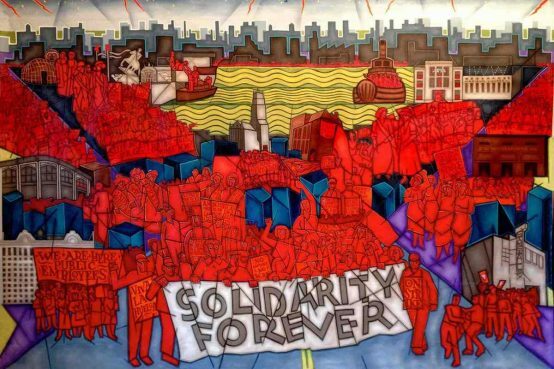 The main themes of almost all the research have been the prediction of massive job dislocation, increased precarious work, downward pressure on wages and exacerbated inequality unless robust policies are put in place to protect workers’ interests. Even a recent IMF working paper modelling the impact of new technologies cautioned that without vigorous policy responses, “the labour share [of national income] declines substantially and overall inequality rises”. The World Bank’s upcoming World Development Report 2019: The Changing Nature of Work, scheduled for publication in October, presents a vivid contrast to this understanding. The WDR seeks to debunk what it considers misapprehensions about the impact of the ‘gig economy’ and claims that, contrary to popular perceptions and substantial evidence, inequality is decreasing. High rates of job informality in developing economies may be a legitimate issue but, says the report, they have always been with us and can be resolved if regulations on business operations, such as minimum wages, are substantially weakened. Social security systems financed through contributions from employers and employees to provide pensions and other benefits are, according to the report, another legacy of bygone days that cannot play a meaningful role in developing countries. The draft WDR 2019 suggests no longer obliging firms to assume costs of social protection. Instead, basic income support would be provided by the State, financed through general taxation. While the draft report suggests that some under-taxed sectors or activities could provide revenue for this kind of basic support, these ideas are conjectural at best. 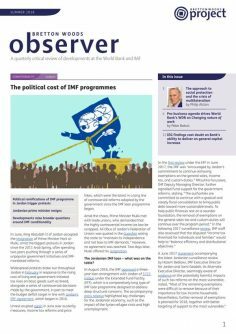 Without extensively enhanced and highly unlikely (in the foreseeable future) international tax cooperation, developing countries will instead have to rely on the other major pillar for financing social protection put forward in the WDR: regressive taxation on consumption, such as value-added taxes. The changing nature of work theme may be new, but the proposed policy refrain sounds drearily familiar to those acquainted with early editions of the Bank’s flagship Doing Business Report (see Observer Spring 2018). For years that report has advocated large-scale labour market deregulation and still supports reducing firms’ obligations to pay taxes and contribute to workers’ pensions or occupational health and safety plans. Transferring costs away from business and onto workers and the State is not therefore a new doctrine in Bank publications, and it is not surprising to find it in the draft WDR 2019. More surprising is the lengths to which the WDR 2019 authors go to concoct a reality that justifies shifting the burden of adjustment from business owners to everyone else. First is their assertion that inequality is decreasing, which they ‘prove’ by presenting a data set of Gini coefficients for a limited number of countries that begins in 2008, the year of the global economic crisis. This ignores a clear trend of increasing income and wealth inequality in most countries since the 1980s and is contradicted by declining wage-share data to which the WDR briefly refers. Another is the repeated claim that burdensome labour market and other regulations are the reason that informality remains high, even though the report concedes there is limited evidence of this and shows a steady decrease in business creation costs over the past 15 years without perceptible impacts on informality. The Bank’s earlier WDR 2013: Jobs carried out an extensive review of research on the impacts of labour regulations on employment and found that they “tend to be insignificant or modest.” The draft WDR 2019 not only ignores this assessment but departs from WDR 2013, which advocated a level of regulation that is neither “excessive or insufficient”, by encouraging across-the-board labour market deregulation in all countries. Given the future of work theme, in March the International Trade Union Confederation (ITUC) organised a 38-member delegation of labour economists to meet with the WDR team. The latter cancelled the meeting hours before it was due to take place. Only after the International Trade Union Confederation’s general secretary appealed to Bank President Jim Kim and concerns about the report got press attention did a consultation finally occur. The ITUC followed up by submitting 27 pages of concerns and suggestions to the WDR authors. Later, international union bodies and civil society organisations sent a joint letter to the Bank calling for a major redrafting. As of this writing, the report continues to espouse a starkly pro-business agenda which contradicts the Bank’s own objective to reduce global inequality.